Jamyang Loter Wangpo (Tib. འཇམ་དབྱངས་བློ་གཏེར་དབང་པོ་, Wyl. ‘jam dbyangs blo gter dbang po) aka Thartse Pönlop Loter Wangpo (1847-1914) — an important Rime Sakya master of Ngor Thartse Monastery who played a key role in the Rimé movement. He was a disciple of Jamyang Khyentse Wangpo and a teacher of Jamyang Khyentse Chökyi Lodrö. He is well known for compiling the Compendium of Tantras under the inspiration of his guru, Jamyang Khyentse Wangpo as well as publishing the very first printed edition of the Explanation for Private Disciples of the Lamdre system of the Sakya School, which before that had been transmitted only orally and was tenuously preserved in manuscript form. Jamyang Loter Wangpo also received Dzogchen instructions from Nyoshul Lungtok. The collection of 139 painted mandala thangkas for the Compendium of Tantras was saved in 1958 by Sonam Gyatso Thartse Khen Rinpoche, and later published in more than one edition. 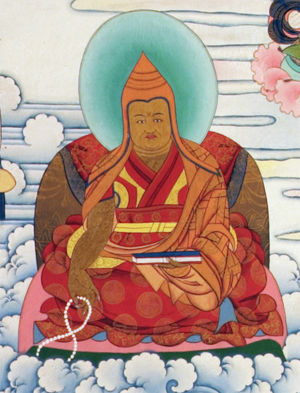 In addition to his tantric works, Loter Wangpo composed commentaries to the Abhidharmakosha and Sakya Pandita's Treasury of Valid Reasoning. He composed a Dzogchen instruction manual (ཁྲིད་ཡིག་, khrid yig), which, as Nyoshul Khen Rinpoche points out, concluded at the 'increase of experience' (ཉམས་གོང་འཕེལ་, nyams gong 'phel), the second of the four visions, claiming that he had no personal experience of anything beyond that level. This page was last edited on 3 January 2018, at 07:31.